Read MRF® and SSI technology applications case studies. The cylindrical mirror is one element in the Coudé train used for astigmatism compensation in the system. The goal of the project was to minimize the surface error much below full aperture specification to test technology limitations. Aspheres are replacing spherical optics in many applications. A method of production manufacturing for precision aspheres is needed in most optical fabrication facilities. Q-flex MRF platforms enables deterministic and efficient throughput for series production of aspheres. 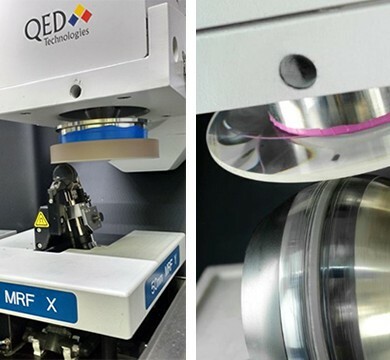 Some advanced technologies require tight specifications around thickness and total thickness variation without compromising other critical tolerances such as surface finish, subsurface damage and contamination. Achieving next generation accuracy and thickness control requirements is extremely difficult using conventional manufacturing processes.